....a milestone was passed today on my blog - over 100,000 hits. What a nice Valentine's Day present! It still amazes me that people take time from their busy lives to stop by here. I wonder if that amazement will ever diminish? Hope not! 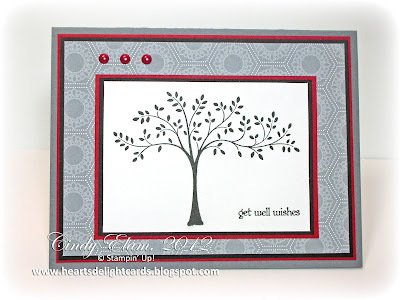 Today's card was sent to an online stamping friend's husband, who just underwent grueling back surgery. The manly color combination would have worked for a birthday or thinking of you card, as well. I hope it makes him feel a wee bit better, knowing someone he's never met is praying for him and sending get well wishes his way! I wonder how you got so good. This is really a fascinating blog, lots of stuff that I can get into. One thing I just want to say is that your Blog is so perfect! More powers to your blog. keep posting! Congrats!!! And of course folks stop by here. You do such gorgeous work! Love the card, and he will too. That will mean a lot to him. Yea for you!!! I'm not sure how many of those hits I am responsible for but I know it is a lot!! I can count on constant inspiration. Thanks for all you do! Beautiful card! SUO Challenge #38 - Valentine's Colors!